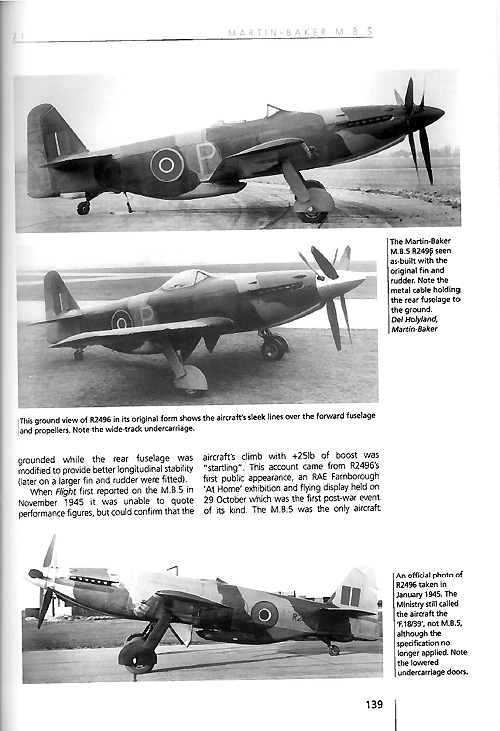 Starship Modeler - British Experimental Combat Aircraft of World War II: Prototypes, Research Aircraft and Failed Production Designs. Overall Rating: 10 - Compelling and worth the price. Specialty Press has been publishing and distributing definitive volumes on experimental aircraft for a while now. Some of these are paper projects from the various factions of the war, and several on post-war concepts. This book is a little different, it focuses on those designs to move past the paper phase into at least experimental development. There are a few trends in the book: aircraft designed to serve a short-term need, concepts meant to serve long-standing requirements, and the bleeding-edge of aircraft technology. I’m glad to see a focus on British designs. When we see experimental designs they’re often German. The British were at least as innovative and daring as the German designers, with some very interesting results. The Luft ‘46 skies would be filled with aircraft like the MB5 fighter, Miles Libellula jets, Hawker high-altitude bombers as well as American Boeing fighters, Skyraiders, Bearcats and a potentially bizarre mixture of new jets. Image: Blackburn B.20 seaplane with extendable hull. Mr. Buttler’s prose is conversational, and far more readable than many books of this type. He manages to incorporate all the relevant data along with commentary providing insight. In this book are designs and concepts I’ve never seen before but make a lot of sense - it’s too bad some never moved into production, they would have moved aviation into different realms. 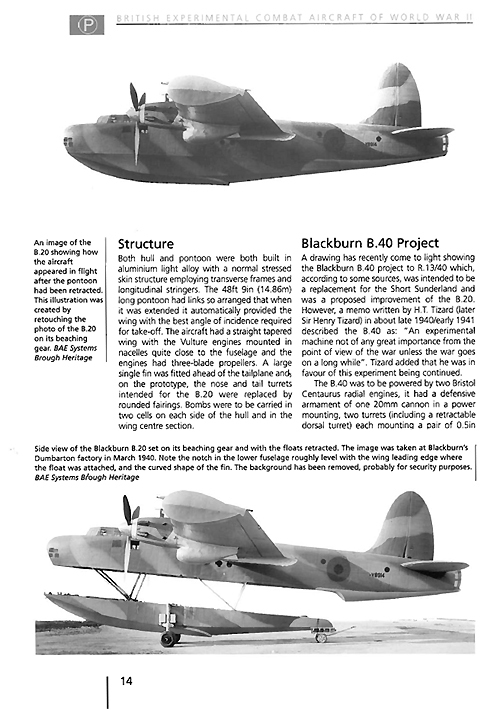 Among these concepts are the Blackburn B.20 and B.40 retractable-hull flying boats designed to reduce the weight and drag of a typical flying boat like the Sunderland, by building a hull which telescopes from the fuselage to allow propeller clearance. These didn’t enter production because of some flyability issues which were later discovered to be correctable. This book also explained a few things I’ve always wondered about, like the British obsession with turret fighters and bombers. The fighters like the Bouton-Paul and Blackburn designs simply weren’t suitable for air superiority. The turret bombers, with their massive cannon turrets seemed like a better idea, but airframe flex ultimately spelled their demise. British designers spent a lot of effort trying to get pusher-designs to work as well as tractor-propeller fighters. They weren’t alone, the American XP-55 and XP-56 as well as SAAB’s J-21 and the Japanese J7W Shinden are notable contemporaries. No one quite figured out how to properly use canard wings, though their advantages were obvious. Miles Aviation did a better job than most, but ultimately these designs would do little more than pave the way for the jet fighters to come - like the Handley-Page designs. Bomber, fighter, attack, observation and seaplane development was pretty diverse, and only coalesced around a few designs which entered full production. Some of these aircraft were born of desperation, others from curiosity. The competition to the eventually successful designs are in this book, some of it very attractive and all of it very interesting. Additionally, there are one-off experimental designs, testbeds and designs specifically made to be testbeds. 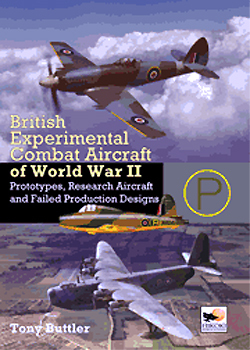 British Experimental Combat Aircraft of WWII is a very well-executed book. It makes fine light reading if you want to skim over the technical details. 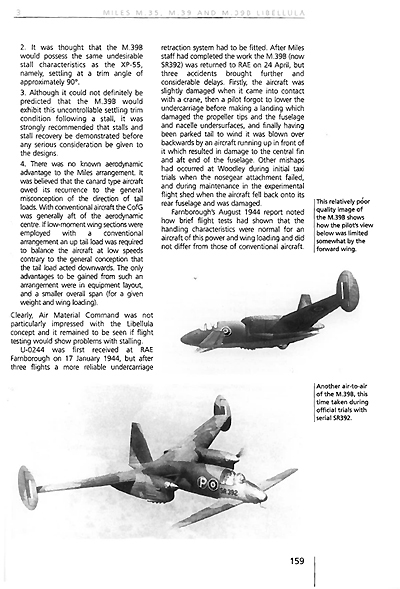 It also provides an insight into the mindset of the British as they faced a bleak and uncertain future, how they planned to make the most of what they had, and of course an overview of the legendary British aircraft design firms. What’s here for the science fiction modeler? A lot, if you consider conjectural aircraft science fiction, which we should. Also, there are a lot of unusual concepts you can apply to your own kitbashing efforts. If you keep a foot in both aircraft and SF modeling, this is a book you really should consider buying. If you’re interested in aircraft design and history, this book should be equally compelling. It’s easily worth the price. I have yet to read a Specialty Press book to which I can’t apply similar praise. Keep up the good work. This page copyright © 2013 Starship Modeler. First posted on 13 February 2013.